Anne, the mastermind behind Seattle Sundries soaps, has a book review up on her blog of my book, The Non-Toxic Avenger: What you don't know can hurt you. 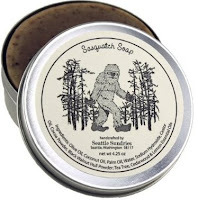 We did a little book to soap barter a week or so ago and, while she's been enjoying my book, I've been enjoying a little Sasquatchin' in the shower. Don't tell my husband. In any case, go check out the book review. It's got a great perspective coming from your "average" consumer (i.e. not a nutball like me), and you can also find out how my book "will simultaneously educate, motivate and scare the wrinkle-resistant pants off of you".